Ladybird by Design has landed at the House of Illustration, near King’s Cross station in London. This scaled-down version of the exhibition from earlier this year at the De La Warr Pavilion, celebrates the centenary of the educational imprint that gave us everything from Peter and Jane (aka the Key Words Reading Scheme), to books on science, history, fairy tales and the Bible. 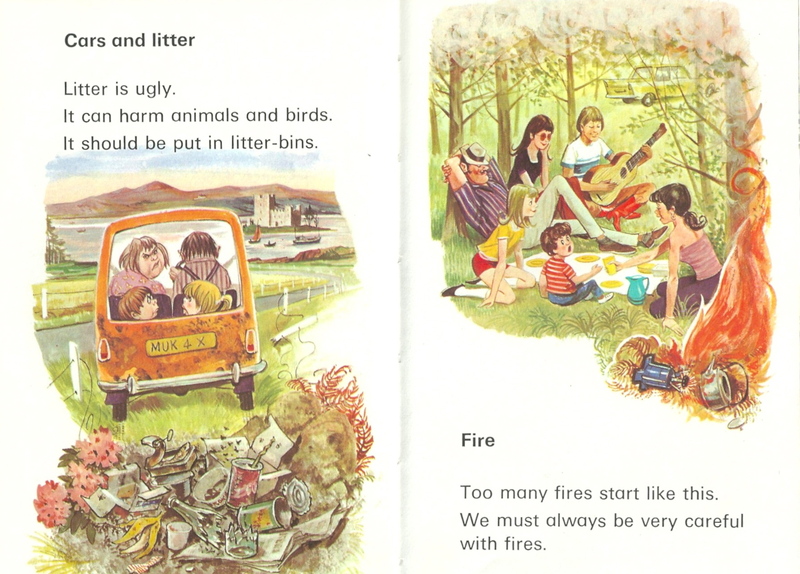 As an atheist, I have no hesitation in labelling the Bible as the ultimate “Big Book of Fairy Tales”, but there’s no place for irreverent observations like that in the wonderfully wholesome World of Ladybird. This exhibition focuses on the imprint’s golden age – from 1958 to the early 70s – the mid-century period in which I grew up and began to discover the world through the brilliance of Ladybird illustrators like Robert Ayton, John Berry and Charles Tunnicliffe. 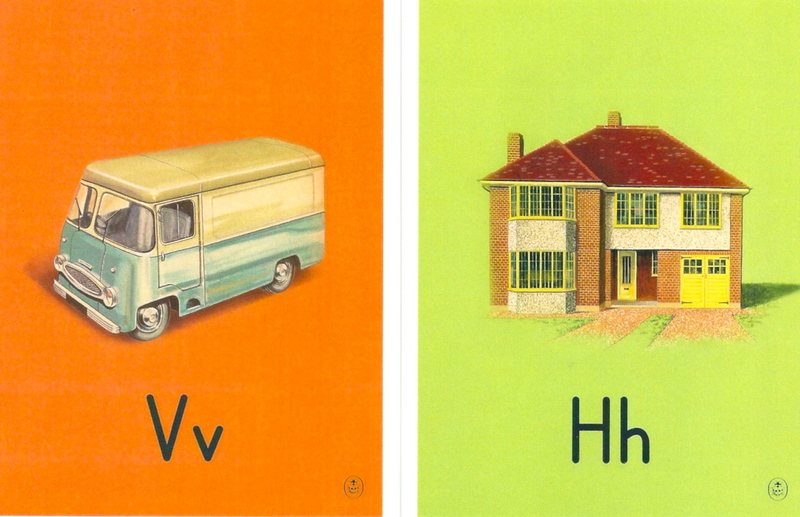 Though you won’t find the word “icon” in the meticulously rendered illustrations of the Ladybird abc, critics do tend to characterise some of the imprint’s most well-loved creations as iconic. Take Harry Wingfield’s gorgeous series of tableaux for Shopping with Mother (1958). Mummy, smartly dressed in hat and gloves, guides her rosy-cheeked offspring down an old-fashioned high street (butcher, baker, greengrocer) in those halycon days before Decimalisation, the Internet and the Tescofication of Britain. In the real world those kids would have been throwing a wobbly, pilfering sweets or just demanding to be taken home immediately. But in Ladybirdland everything is serene and pristine, like Tunnicliffe’s beautiful renditions of the changing seasons in the What to Look for series. 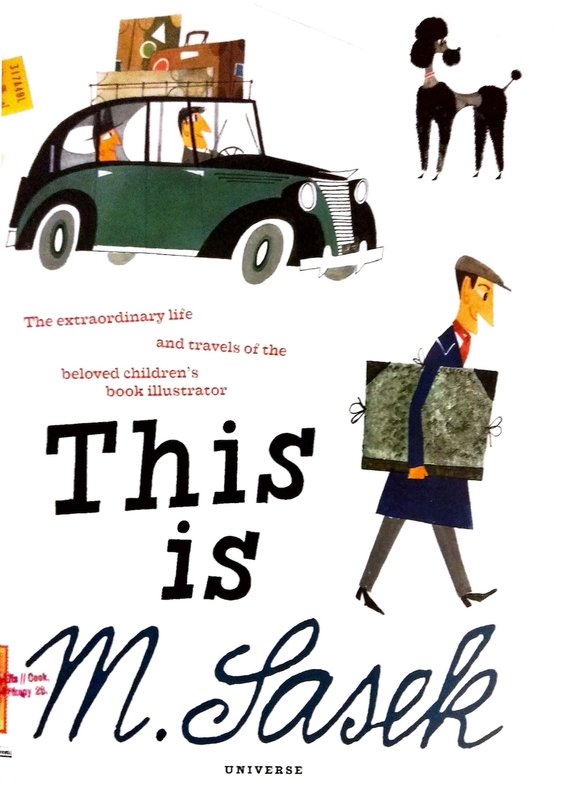 I recommend the Ladybird by Design exhibition if you’re a Ladybird collector, or you’re interested in mid-century British illustration, or you’ve reached that (middle) age when you want to wallow in nostalgia for the childhood you never had. If Ladybird is too squeaky clean for your tastes, the spoofers have also thrown up some gems, including the De La Warr Pavilion’s Ladybird Reworked exhibit and artist Miriam Elia’s controversial “We go to the gallery” book. I was surprised to find that Ladybird did have an edgier side. I picked up a copy of man and his car, a Ladybird Leaders title from 1974 that presents the automobile in a distinctly dystopian light. “Cars seem to be everywhere” declares author James Webster, before linking these four-wheeled menaces to a wide range of rude, antisocial and criminal behaviour. 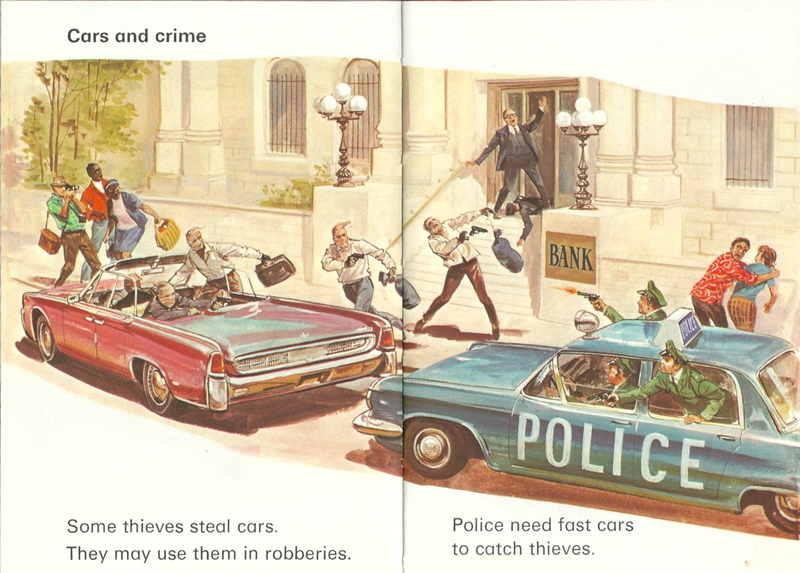 Note how the author tactfully omits to mention those big old guns that the police (in their “fast cars”) are firing at the thieves. Well how else are you going to keep the utopia that is Ladybirdland safe for all the boys and girls? Love this Susannah! 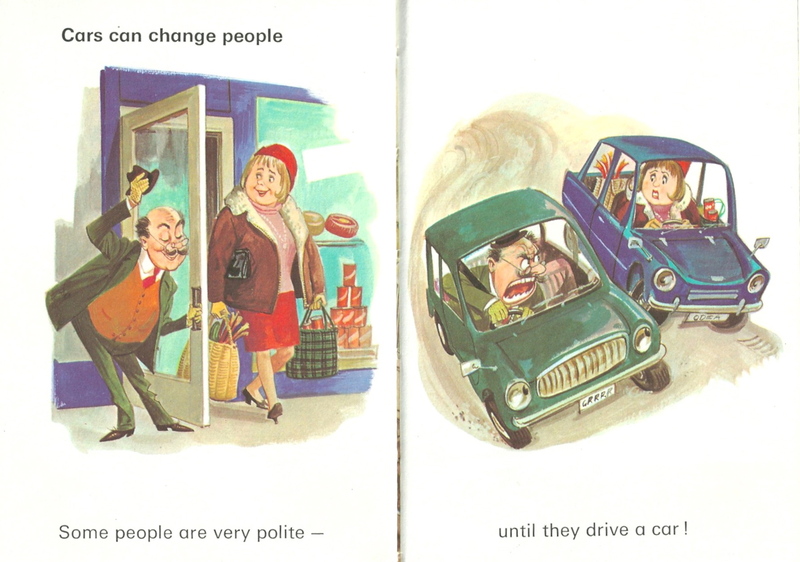 Very surprised that “Man and his Car” got through the Ladybird censors. I wonder if there were others like it? 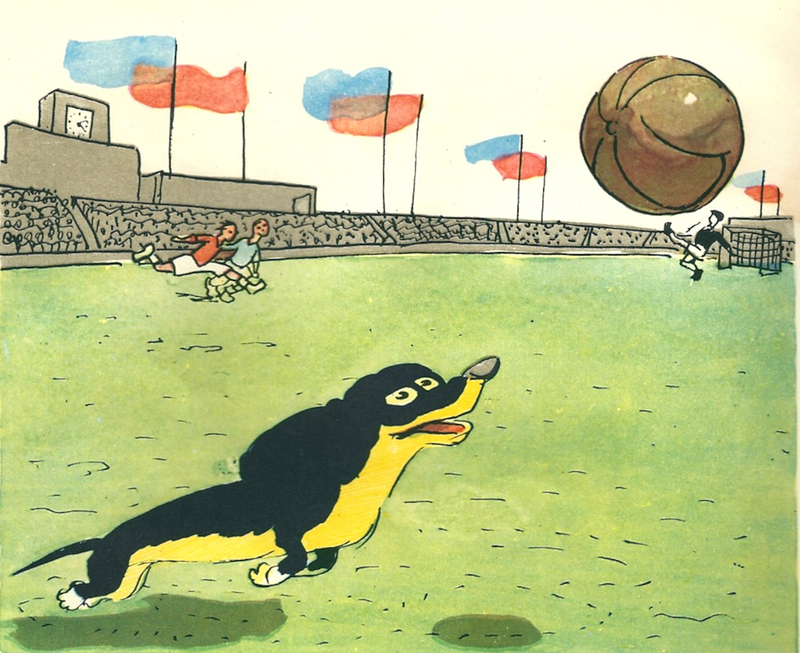 That book does sound more “Dung Beetle” than Ladybird, doesn’t it. 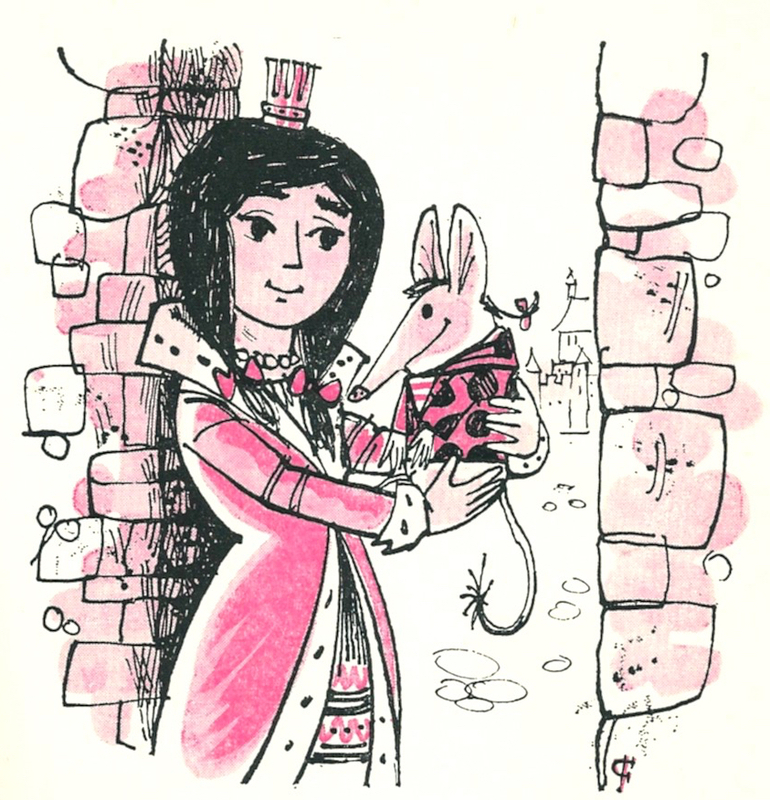 I see there’s a Laura Carlin exhibition coming later in the year at the House of Illustration. 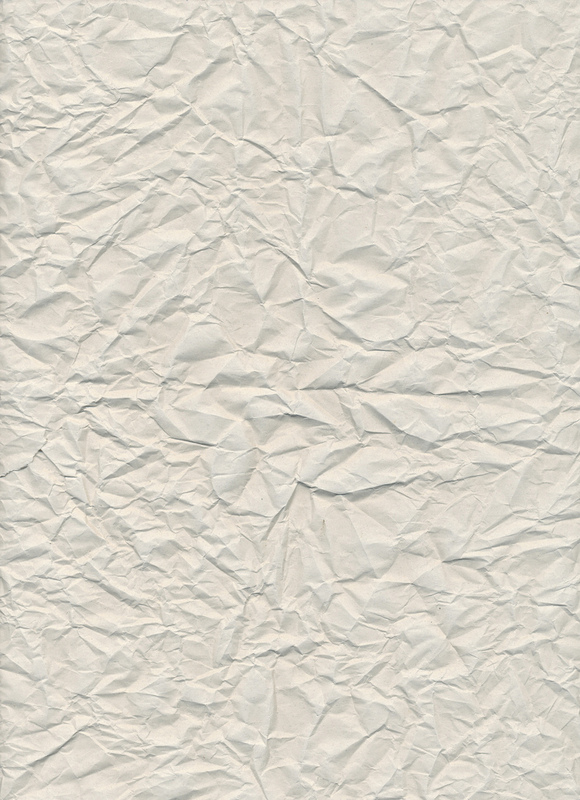 Good opportunity for a Children’s Book Illustration plug . . .